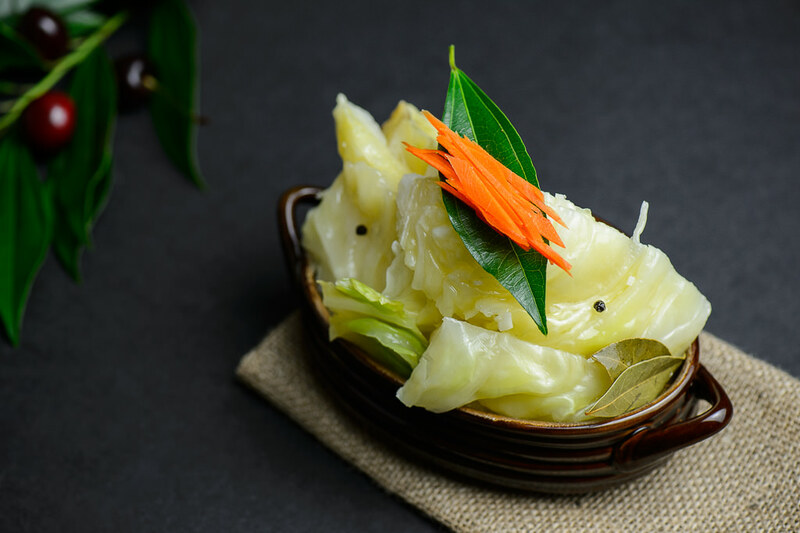 This pickled cabbage recipe was generously shared with me by my friend, Munisa. In my books she is my cabbage girl :D She teaches me all kinds of recipes involving cabbages. At times she gives me recipes for DESSERTS! Pavlova cake anyone? they will grace the face of my blog very soon. Man, this girl is good! This recipe is very, very easy to make and does not require much effort or strength. However, it does include the usage of 70% vinegar essence, to kick-start the fermentation process. As oppose my earlier recipe, which calls for some extra ingredients to make the brine work. Nevertheless, vinegar only complements the taste of this pickled cabbage and adds that sour kick to it. We finished it off in about 3 days. That’s how much we loved it! I cannot recommend this recipe enough. It can be a base to many salads and appetizers. It can also accompany many entrees! We use it to complement meats, soups and sandwiches, too. 70% vinegar essence can be found in many Russian, European or international stores. Be very careful with it though. The usual white vinegar we have in U.S. stores are only 6% in acidity. If ingested 70% vinegar essence can be deadly. If you buy some for the kitchen use, please make absolute sure that it is out of reach for everyone in your household. 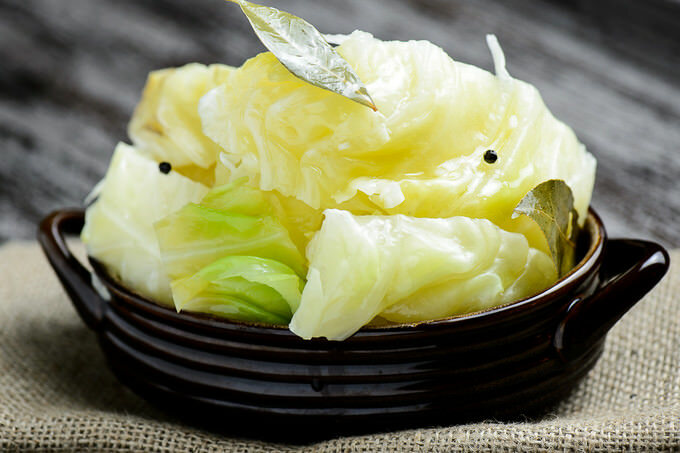 Remove any brown or wilted leaves on the outside of the cabbage. 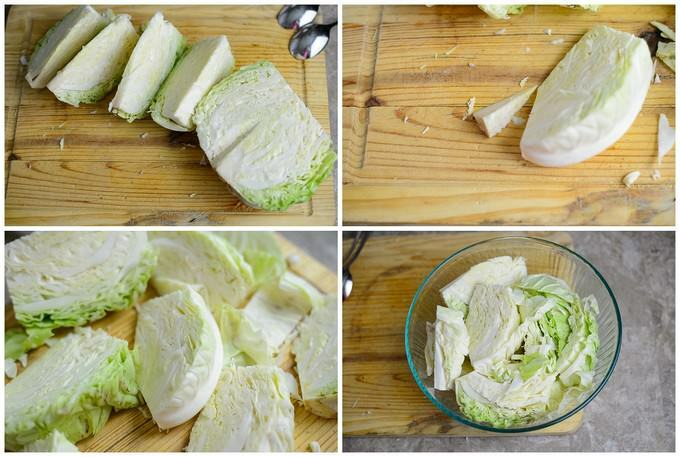 Cut the cabbage head into 6 pieces and remove the thick stems at the core. In a large bowl (or a container) place the cabbage pieces, making sure they fit snugly. 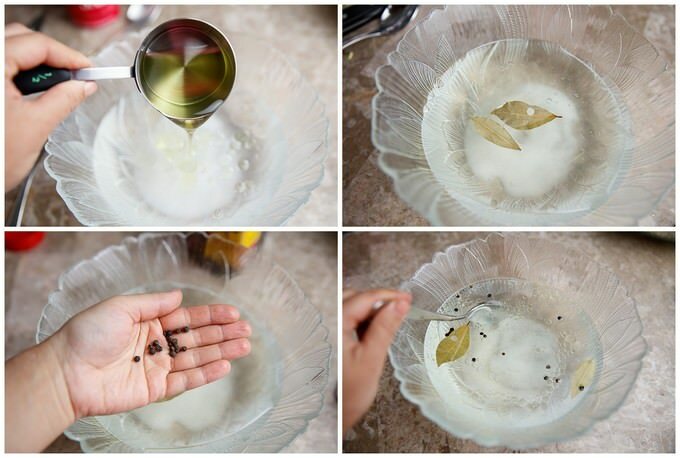 In a medium bowl prep the brine by adding the pre-boiled and cooled water, salt, sugar, 70% vinegar, oil, bay leaves, peppercorns. Mix all the spices well. 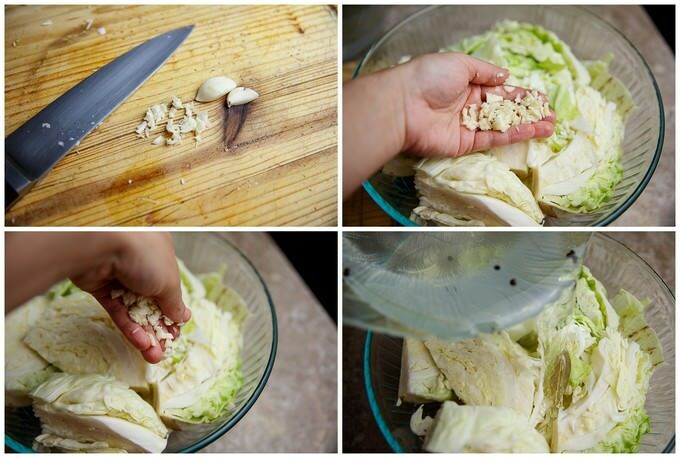 Chop up (or crush) garlic cloves and distribute them among the cabbage pieces evenly. Pour the ready brine mixture over the cabbage pieces. Cover the cabbages (not the container) with a lid or a big enough plate. It should be just big enough to cover the cabbages and keep them under press when something put on top. Now, find something which can be used as a pressing tool and can be placed on top of the lid. I used my 10-lb dumbbell, which was perfect. Keep the cabbages under press, at room temperature for 3 days. When the time is up, open up the press and taste the awesomeness! At this time your cabbage is ready for consumption. Once ready, keep the pickled cabbages refrigerated. his recipe was generously shared with me by one of my friends, Munisa. 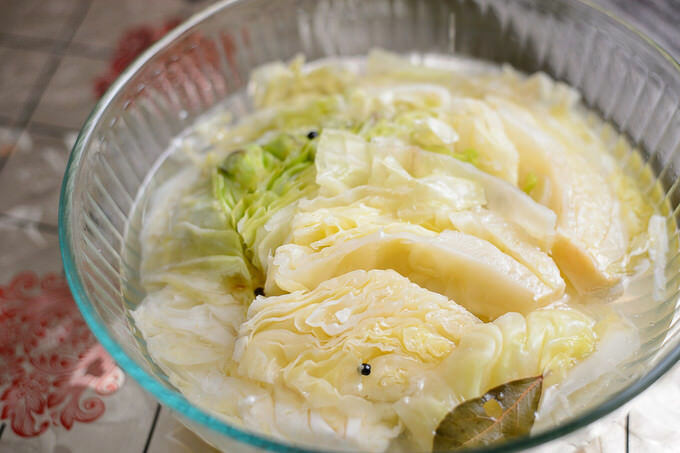 This pickled cabbage is very, very easy to make and does not require much effort or strength. 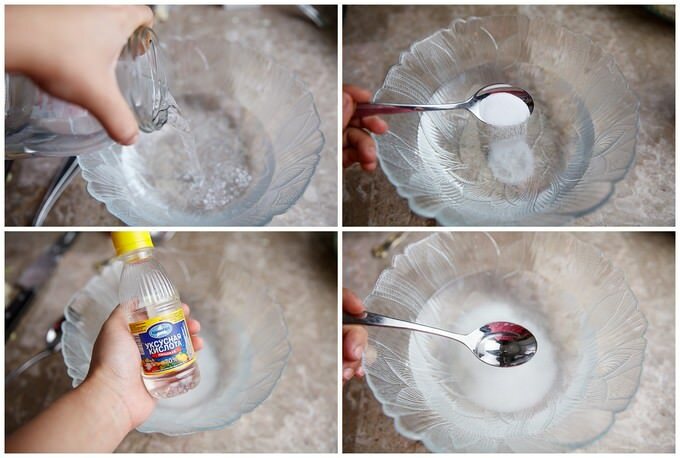 I cannot recommend this recipe enough. It can be a base to many salads and appetizers. It can also accompany many entrees! We use it to complement meats, soups and sandwiches, too. NOTE: 70% vinegar essence can be found in many Russian, European or international stores. Be very careful with it though. The usual white vinegar we have in U.S. stores are only 6% in acidity. If ingested 70% vinegar essence can be deadly. If you buy some for the kitchen use, please make absolute sure that it is out of reach for everyone in your household. Keep the cabbages under press, at room temperature for 3 days. When the time is up, open up the press and taste the awesomeness! At this time your cabbage is ready for consumption. Once ready keep the pickled cabbages refrigerated. this is awesome! I have been craving it – but making it like my dad in Siberia is unthinkable. He uses a huge barrel and it always turns out delicious. I don’t really like what they sell here in stores, so will have to try this! thanks for sharing! Hi Maya, I hope your pickled cabbage turned out quite well. Samar, unfortunately I cannot recommend any other alternatives. You are more than welcome to give it a shot with a weaker vinegar base, like 6%. Let me know how it turns out. Made this on Sunday from cabbages I salvaged from my slug ravaged allotment first bite tonight quite delicious. Don’t think it’s going to last very long. Thanks for sharing your recipe.